Megan Daugherty, left, helps her mom, Stella Daugherty, look through a box of books for $1.00 at The Tucson Festival of Books. Stella teaches third grade at Ford Elementary School and wanted to buy books for her students. 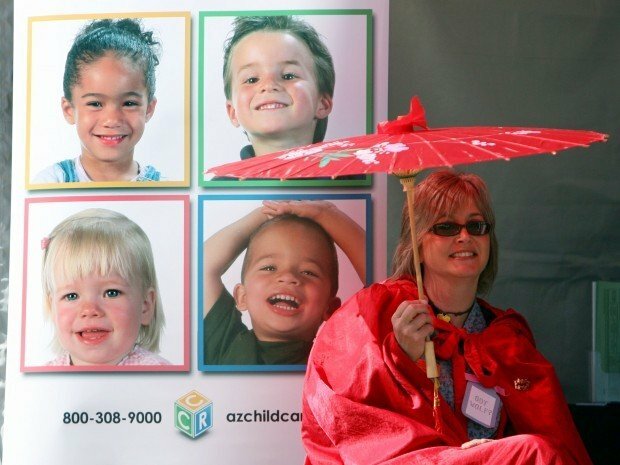 Shayna Smith shades herself from the sun while sitting at the Children and Family Resource, Inc. tent at The Tucson Festival of Books. Jacob Spier, 10, makes his move in a game of checkers at the Tucson Festival of Books. Merl Reagle, crossword puzzle creator, speaks at the Tucson Festival of Books. 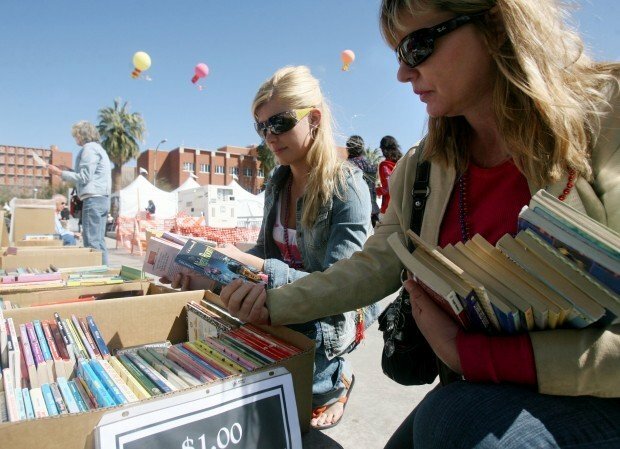 Marilyn Barnhart, left, peruses some books inside of the University of Arizona bookstore tent during the Tucson Festival of Books. Sandy Oglesby is a storyteller from Phoenix and performs during the Tucson Festival of Books. Author Christopher Reich, right, talks to an audience as Janice Kaplan, an author, sits in the background during the Tucson Festival of Books. Jackie Storrer, right, tries her best to figure out the clues on a giant crossword as Jared Loughner, a volunteer, stands in the background during the Tucson Festival of Books. Patrick McFarlin, right, and Deborah Madison talk about their book "What We Eat When We Eat Alone," during the Tucson Festival of Books. Storm troopers from the film series Star Wars invade the Tucson Festival of Books on the University of Arizona campus. Elizabeth Winterbourne, 9, listens as her father, David Winterbourne answers a question she asked inside the Pima County Library tent where they were recording an interview during the Tucson Festival of Books. Crowds wander through all the tents during the Tucson Festival of Books at the campus of the University of Arizona. Author and screenwriter, Elmore Leonard, signs some copies of his books during the Tucson Festival of Books. Thor Neill, 10, contemplates his next move in an over-sized game of chess during the Tucson Festival of Books. Jack Fox, president and CEO of The Communications Institute, speaks during the Tucson Festival of Books. Joseph Kalt, a Ford Foundation professor of international political economy at the John F. Kennedy School of Government at Harvard University, speaks during the Tucson Festival of Books. Stephen Happel, a professor of economics at Arizona State University, speaks during the Tucson Festival of Books. Sunday is May 4, an unofficial Star Wars holiday. Hotel Congress has a food, drinks and a trivia contest. Q: What beats a good read on a day so ideal? There was only one place in Tucson last weekend where you could hear Bill Gates' father recall his son's defiant youth. William Gates Sr. was one of more than 400 authors featured at the two-day Tucson Festival of Books, which wrapped up Sunday and drew crowds in the thousands.